If you take photos of birds (or go out to see birds) it’s important to know the neighborhood. 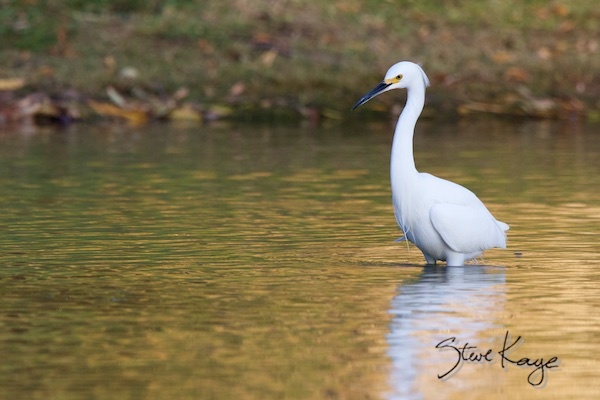 For example, there is a Snowy Egret that works the east end of the lake in Carbon Canyon Regional Park (Brea, CA) in the late afternoon. So it’s possible to take photos like this one, with golden light reflecting off the water. And here’s a photo tip. Note where I placed the bird in the frame. Since a Snowy Egret has long legs, I’ve left enough space below it to include the legs even though they are hidden by water. This makes the photo logically correct. I’ve had to point this out at least a few times when I judged photo contests at local camera clubs. There are other birds in this park now. These include Acorn Woodpeckers, Western Bluebirds, and American Coots. Of special note, there is also a Belted Kingfisher, male, that is flying back and forth across the lake. If you were there, you would hear its distinctive chatter before you see it. Fortunately, this bird is a bit tolerant of people, so it’s possible to catch a good view of it. With a bit of patience, you will discover which trees the Belted Kingfisher prefers. So now you can wait for a better view. This, by the way, is another example of how we benefit when we know the neighborhood. I don’t find a lot of birds in my neighbourhood, but I do keep track of the trees.